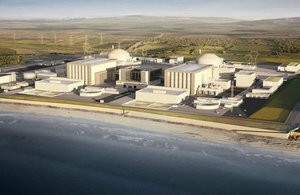 The government of the U.K. announced on Wednesday that EDF and China General Nuclear (CGN) Corp. have confirmed their commitments to building Hinkley Point C.
They state that the facility will be capable of producing enough electricity to power approximately six million homes across the country. The announcement also states that the facility and its construction will be able to provide significant economic benefits to the U.K.; it is expected to support up to 25,000 jobs and 1,000 apprenticeships. Under the agreement reached between EDF and CNG, EDF will own 66.5 percent and CGN will take 33.5 percent. Want to get notified whenever we write about Department for Energy & Climate Change ? Next time we write about Department for Energy & Climate Change, we'll email you a link to the story. You may edit your settings or unsubscribe at any time.